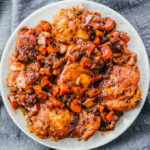 A savory Instant Pot chicken thigh dinner with onions, carrots, and a glaze-like balsamic sauce. Keto, low carb, and gluten free. Pat chicken thighs dry with paper towels. Generously season on both sides with salt and pepper. Select the saute mode on the pressure cooker for medium heat. Add olive oil to coat the bottom of the pot. Melt butter on top of the oil. When the display reads HOT, work in 2-3 batches to add chicken thighs to the pot in a single layer. Don’t crowd them. Cook for a few minutes on each side before transferring to a plate. Repeat for the remaining thighs. Add carrots, onions, and garlic. Cook for a few minutes, stirring frequently. Turn off the saute mode. Add red wine and balsamic vinegar. Stir together, loosening any flavorful brown bits stuck to the bottom of the pot. Return all chicken thighs to the pot in a single layer, placing them snugly on top of the carrots and onions. Secure and seal the lid. Cook for 10 minutes at high pressure followed by a manual pressure release. Uncover and turn on the saute mode. Let the liquid boil for about 5 minutes to thicken into a slightly sticky sauce. You don’t need to stir or touch the chicken. Turn off the saute mode. Serve chicken onto plates and pour sauce on top. This recipe yields 7 g net carbs per serving.